A space probe is any unmanned spacecraft designed to carry out physical studies of the Moon, other planets, or outer space. Space probes take pictures, measure atmospheric conditions, and collect soil samples then bring or report the data back to Earth. More than 30 space probes have been launched since the former Soviet Union first fired Luna 1 toward the Moon in 1959. Probes have now visited every planet in the solar system except for Pluto. Two have even left the solar system and headed into the interstellar medium. The earliest probes traveled to the Moon. The Soviets launched a series of Luna probes that took the first pictures of the far side of the Moon. In 1966, Luna 9 made the first successful landing on the Moon and sent back television footage from the Moon's surface. The National Aeronautics and Space Administration (NASA) landed Surveyor on the Moon four months after Luna 9. The Surveyor had more sophisticated landing capability and sent back more than 11,000 pictures. In the meantime, NASA launched the first series of planetary probes, called Mariner. Mariner 2 first reached Venus in 1962. Later Mariner spacecraft flew by Mars in 1964 and 1969, providing detailed images of that planet. 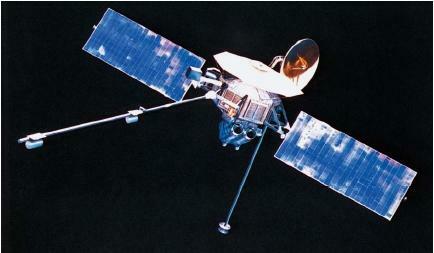 In 1971, Mariner 9 became the first spacecraft to orbit Mars. During its year in orbit, Mariner 9 transmitted footage of an intense Martian dust storm as well as images of 90 percent of the planet's surface and the two Martian moons. The Soviets also put probes in orbit around Mars in 1971. Mars 2 and Mars 3 carried landing vehicles that successfully dropped to the planet's surface, but in each case radio contact was lost after about 20 seconds. In 1976, the U.S. probes Viking 1 and Viking 2 had more direct encounters with Mars. Viking 1 made the first successful soft landing on Mars on July 20, 1976. Soon after, Viking 2 landed on the opposite side of the planet. The Viking probes reported on the Martian weather and photographed almost the entire surface of the planet. Twenty years after the Voyager probes were released, NASA launched the Mars Global Surveyor and the Mars Pathfinder to revisit Mars. The Mars Global Surveyor completed its mapping mission of Mars in early 2001 after having sent back tens of thousands of images of the planet. Its main mission accomplished, NASA engineers hope to use Surveyor to relay commands to twin rovers slated to land on the planet in early 2004. The Mars Pathfinder landed on the planet's surface on July 4, 1997, and released the Sojourner rover, which sent back to Earth images and analyses of the Martian terrain, including chemical analyses of rocks and the soil. Not all probe sent to Mars were as productive as the Mars Global Surveyor and the Mars Pathfinder. In 1999, NASA lost two probes, the Mars Climate Orbiter and the Mars Polar Lander. As its name implies the Mars Climate Orbiter was to have explored the Martian atmosphere, while the Mars Polar Lander was to have explored the planet's landscape in search of water. Neither was able to land successfully due to an error in converting English and metric measurements (for the Mars Climate Orbiter ) and a software glitch (for the Mars Polar Lander ). From 1970 to 1983, the Soviets concentrated mostly on exploring Venus. They sent out a series of Venera and Vega probes that landed on Venus, analyzed its oil, took detailed photographs, studied the atmosphere, and mapped the planet using radar. Mercury was visited by a probe in 1974 when Mariner 10 came within 470 miles (756 kilometers) of the planet and photographed about 40 percent of its surface. The probe then went into orbit around the Sun and flew past Mercury twice more in the next year before running out of fuel. NASA sent Pioneer probes to explore the outer planets. Pioneer 10 reached Jupiter in 1973 and took the first close-up photos of the giant planet. It then kept traveling, crossing the orbit of Pluto and leaving the solar system in 1983. Pioneer 11 traveled to Saturn, where it collected valuable information about the planet's rings. 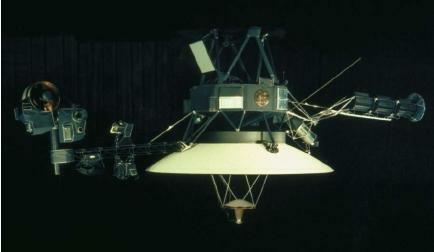 NASA next introduced the Voyager 1 and 2 probes, more sophisticated versions of the Pioneers. Launched in 1977, they flew by Jupiter two years later and took pictures of the planet's swirling colors, volcanic moons, and its previously undiscovered ring. The Voyager space probes then headed for Saturn. In 1980 and 1981, they sent back detailed photos of Saturn's spectacular rings and its vast collection of moons. Voyager 2 then traveled to Neptune, which it reached in 1989, while Voyager 1 continued on a path to the edge of the solar system and beyond. beginning of 2001, Galileo was still sending valuable scientific information about Jupiter and its moons back to Earth. In February 1996, NASA launched NEAR (Near Earth Asteroid Rendezvous) Shoemaker, an unmanned spacecraft that was to become the first to orbit an asteroid. In April 2000, it began a circular orbit around the asteroid Eros. During its one-year mission around Eros, the spacecraft took measurements to determine the mass, density, chemical composition, and other geological characteristics of the asteroid. It also beamed some 160,000 images of Eros back to Earth. In February 2001, NEAR Shoemaker used the last of its fuel in a successful attempt to land on the surface of the asteroid. Once on the surface, it continued to collect invaluable data about the oddly shaped Eros before it was finally shut down by NASA. NASA has plans underway for many more space probes. The Cassini orbiter, which was launched in October 1997, will study Saturn and its moon. It is scheduled to reach the planet in 2004. Cassini will drop a mini-probe, called Huygens, onto the surface of Titan, Saturn's largest moon, for a detailed look. Cassini will then go into orbit around Saturn. With a desire to return to Mars, NASA launched the Mars Odyssey in April 2001. Once in orbit around the planet by the fall of that year, the spacecraft will examine the composition of the planet's surface and try to detect water and shallow buried ice. In a mission planned by the European Space Agency and the Italian space agency, NASA will launch the Mars Express in mid-2003. It will search for subsurface water from orbit and deliver a lander, Beagle 2, to the Martian surface. NASA will also launch two powerful rovers to Mars in 2003, each to a different region of the planet to look for water. And in 2005, NASA plans to launch the Mars Reconnaissance Orbiter, a powerful scientific orbiter that will map the Martian surface with an high-definition camera. NASA had hoped to explore Pluto sometime in the twenty-first century by sending the Pluto-Kuiper Express. This probe was to have consisted of two spacecraft, each taking about eight years to reach the farthest planet in our solar system. Originally scheduled to launch in 2004 and arrive at Pluto in 2012, the Pluto-Kuiper Express was put on hold by NASA in the fall of 2000 because of high costs. It was then scraped in the spring of 2001 after President George W. Bush unveiled his 2002 budget, which provided no money for the project. This is a really good sight! Thanks for everything! Thank you for your help. It helped me with my scavenger hunt. Thanks a lot for such good information.I really liked this site a lot . It gave me a very nice iformation on space probes. that was REALLY helpful information for my sciencd project!!! This website helped achieve my science work Thank You. OMG,this helped finish up my science project on Saturn. I decided to put the space probes that visited Saturn. Thanks for this information. Also to Google that brought me here. Good-Bye!!!!!!!!!!!!! i got a 100% on my project because of this.it really helped me understand.thanks! Thanks alot for the info you guys pin point every thing thats awesome! why cant i find were the space pobe is plzz get back to me .. This site gives me a lot of information and ideas I am very thankful.